The Kuvasz is a majestic, well-proportioned white sheepdog with a very handsome head. The Kuvasz (plural is Kuvaszok) is a working dog of larger size, sturdy, well balanced, neither lanky nor cobby. It is white in color with no markings. It is extremely loyal, obedient, active and strong but is wary of strangers. It makes an excellent watch dog and guard dog. The Kuvasz is intelligent and curious; it is bold, determined, brave and fearless. It is an outstanding herder and defender of the flock against wolves; it has strong protective instincts. It is easy to housebreak. This breed is devoted to its family, forming a strong bond with them, though the Kuvasz is a very independent breed and may even be standoffish with its owners. This is not a breed for everyone, it requires an owner who knows how to display strong leadership and who is willing to spend a lot of time socializing and training. It must be extensively socialized at an early age to combat its extremely protective personality. It is not an easy breed to obedience train, as it was bred to work independently of men; it is willful, but also quite sensitive to criticism. Do not treat this dog harshly. It is important that all family members should be taught how to handle the dog. It is highly advisable to accustom the puppy to handling strangers, both for your veterinarian's sake and if you wish to show the dog. If the dog is going to live with children, it is best, if possible, to select a Kuvasz pup from Kuvasz parents who love children. It is usually gentle and patient with its own family's children, but may not be trustworthy with others. Do not leave this dog unsupervised with small children and their friends! Though puppies can easily accept other animals, adult Kuvasz is quite combative and may resent intrusions of a new canine or other animal into the household, but it can also be very gentle with other pets and livestock. Be sure to supervise and teach your Kuvasz that the newcomers are part of the family; do not leave the new dog alone with an adult Kuvasz until you are absolutely certain they will not fight. Male to male aggression is common. The biggest key to training this dog is to understand the nature of the breed as an independent guardian; it is very important not to use harsh training methods. If you wish your Kuvasz to be a livestock guardian, special training is necessary. It is advisable to consult an expert to learn how to train your dog. Once bonded to the livestock, this dog is going to make sure that nothing ever, can harm them. That is their nature. Longhaired, slightly wavy or flat double coat, soft undercoat. The coat should be brushed weekly. Avoid bathing this dog, as the coat naturally sheds dirt and bathing will remove the oils that give the coat this property. The more you bathe this dog the more it will need to be bathed. Instead of bathing, the dog should be brushed frequently.The Kuvasz requires daily brushing to keep their coat in good shape and free from parasites. They shed in warm weather. The coat is quite demanding of attention if one is to keep it clean. Long walks or hikes and a large fenced yard for exercise are necessary for the Kuvasz. Eyelid disorders, hip dysplasia and other orthopedic problems, deafness, thyroid problems, and von Willebrand's disease (a blood clotting disease). Long walks or hikes and a large fenced yard for exercise are necessary for the Kuvasz. 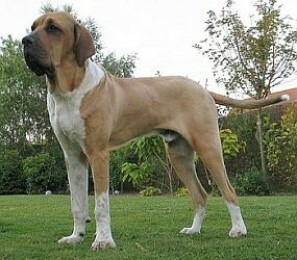 They need enough exercise to maintain a healthy weight, as they are large, strong dogs. The Kuvasz is very spirited and energetic. Needs obedience training and socialization as a young puppy to be a well-behaved member of a family. They tend to be very independent in thinking, therefore training is essential, especially if one is to be around neighbors or other people and animals often. Space is very important for they are a large, active breed. They are more suited for country living, but will adapt if a large fenced yard is provided. Owners of the Kuvasz need to be assertive and firm in their training. The best owner for this breed would be an active, dog-experienced person or family living in a rural or suburban environment.